In the early days, before the establishment of Hongkong as a British Colony, Whampoa was the farthest point to which the Chinese permitted foreign ships to proceed up the West River. 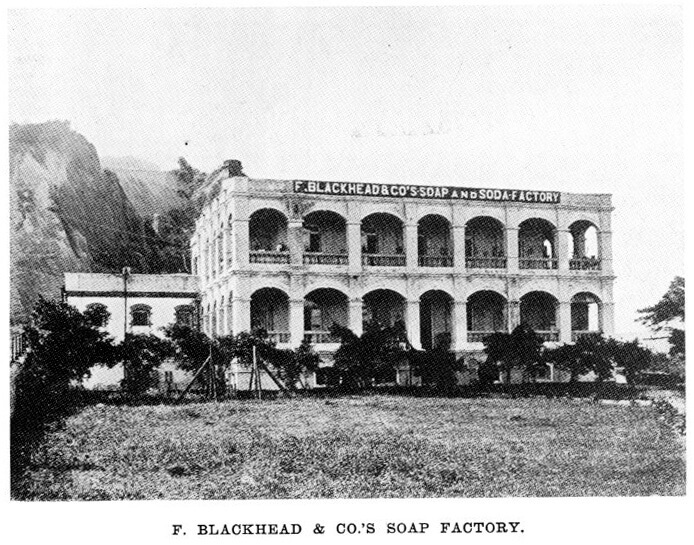 Many difficulties were experienced at this port by vessels in obtaining stores, and it was this fact which led to the establishment of the firm of F. Blackhead & Co. by Mr. B. Schwarzkopf. Purchasing a dismantled Chinese junk of suitable proportions, Mr. Schwarzkopf commenced business on the waters of the harbour in 1855. There was a good opening for the new venture, but many restrictions were placed upon foreign traders by Chinese officials, and there was little guarantee of protection against the pirates who infested the Chinese waters. In spite of all obstacles, however, Mr, Schwarzkopf built up a thriving trade. But when the troubles at Canton culminated in war between England and China the business was removed to Hongkong, and here it has remained, progressing with the Colony year after year. At about the time when the headquarters were removed from Whampoa to Hongkong a branch was established in the Portuguese city of Macao, where there was great activity in shipping circles on account of the coolie trade. This branch, however, was not destined to meet with overmuch success, for in 1874 the many abuses of the coolie traffic had become so glaring that the traffic was abolished, and the firm, by withdrawing, anticipated the steady decline in Macao’s importance as a shipping port. During Mr. B. Schwarzkopf’s life Messrs. Smith, Schoenemann, Hoeinike, and F. Schwarzkopf were admitted as partners, and the business was conducted by them until 1903, when Mr. Smith and, later on, Mr. Schoenemann left for Europe. They did not, however, live long after their return to the homeland. The firm’s offices are now in that magnificent pile on the water front known as St. George’s Buildings. Here they stock everything that comes under the heading of ship’s stores, for they are contractors to the German, Austrian, and Russian Navies. They are also interested in the coal trade of the Colony. Some years ago they acquired a large parcel of land, known as Blackhead’s Point, at Kowloon, having an extensive deep water frontage, and here they built godowns and a pier constructed on Differdingen piles capable of accommodating quite large vessels. For many years a conspicuous feature of the shipping in the harbour has been Messrs. Blackhead’s large hulk, bearing an advertisement of the famous Red Hand Brand of composition for the bottoms of iron ships, for which the firm has the sole agency in the Colony. The only European sail-making business in Hongkong, also, is conducted by Messrs. Blackhead & Co. Even this does not exhaust the list of their industries, for at Shaukiwan they have established a large soap and soda factory, details of which are given in the section of this work devoted to industries. The present partners in the firm are Messrs. F. Schwarzkopf, son of the founder, and F. Hoehnke. They have branches at Neishiem, Tsingtau, and Tsinanfu, where the business is carried on under the style of F. Schwarzkopf & Co. This article was first posted on 23rd December 2014. My Great Grandfather Andreas Wilhelm Augustus Wohlters worked in the Blackhead Company in the 1800’s. I assume he worked in the Macau area, as my great Grandmother Ceriane Maria da Cruz is from that area. She was the daughter of Edward Fransiceo da Cruz. Are there any records of employees, from that era? As I would be grateful for any information found.